A narrow valley in the foothills of the Caucasus mountains, Pankisi Gorge is back on the local and international media radar. In fact, Pankisi has been the centre of attention for the past year after it was discovered in June 2014 that Abu Omar Al-Shishani, a leading commander in Islamic State, was born and raised here. Bajelidze believes that, at a time when a lot of journalists solely rely on desktop research and online sources, they get disconnected from the reality on the ground, producing unverified and often biased material. Local and international media reports strengthen Pankisi's already infamous reputation as a cradle of radicals, criminals and terrorists in Georgia. This reputation emerged in the late 1990s and early 2000s, when the gorge became a haven not only for thousands of Chechen refugees fleeing the war with Russia, but also a base from which Arab and Chechen militants, allegedly with ties to al-Qaeda, could launch strikes into Russia. By 2004, former Georgian President Mikheil Saakashvili had cleared the gorge of paramilitary fighters – with US support – and dispersed the majority of the area's well-established criminal gangs. The Georgian government's concern for radicalisation in Pankisi, also stems from the possible effect on the country's international reputation. In April 2015, Prime Minister Irakli Garibashvili scolded journalists for their 'hysteria' on Pankisi, damaging Georgia's international image with reports on how Pankisi youth had joined ISIS a couple of months prior. The televised arrest of one of Pankisi's alleged ISIS recruiters by Georgian special forces in June did not calm concerns either. While government officials are preoccupied with maintaining Georgia's international image, residents of Pankisi are becoming increasingly concerned with the spread of Salafism and support for ISIS in their region. Lia Margoshvili is a local director of the Roddy Scott Foundation, a UK charity aimed at providing accessible education for Pankisi youth. Apart from English lessons, Lia gives lectures to local teenagers on the dangers of religious extremism and jihad, encouraging them to study instead. However, fewer and fewer students are coming to her English classes—the Salafi mosque is more enticing. 'We don't have enough funding to motivate our students,' Lia begins, 'we can not pay them to attend our classes, unlike the Salafis who give students 50 laris (£14) per month just to attend theirs.' Lia says that her organisation currently has over a hundred students in various locations across the valley, though a year ago the number was twice that. Pankisi Gorge. Photo: Scott McDonough / Flickr. Margoshvili's school is a perfect example of changes in Pankisi. But why is it happening in predominantly Christian Georgia? 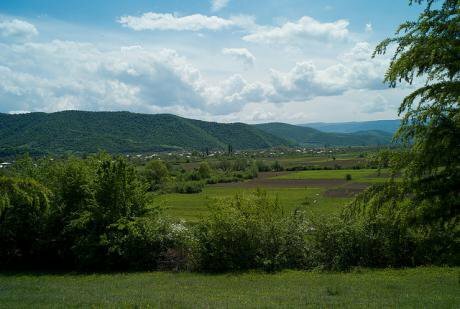 About 10,000 of Pankisi's inhabitants are ethnic Kists, and comprise a majority in the valley. The Kists are an ethnic group descending from Chechens and Ingush who moved to the valley from the North Caucasus between 1830 and 1870. Kists are generally Muslim, but not exclusively so. 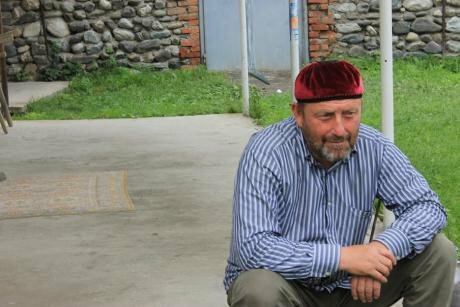 Differences also exist between Muslim residents: the older generation of Kists adhere to traditional Sufism, while the younger generation are keen followers of Salafism, which came to the valley together with Chechen refugees fleeing the Russo-Chechen wars during the 1990s and early 2000s. In contrast to Georgia's other national minorities, Kists have few problems with the Georgian language. While Armenians and Azerbaijanis attribute their isolation and lack of integration to poor knowledge of the state language, most Pankisi residents are bilingual or trilingual, using local Chechen dialect to converse among themselves and Georgian and Russian for talking to officials or outsiders. In addition, their family names have Georgian suffixes (-shvili, -adze). In Georgia, however, common understandings of national belonging are based on ethnic and religious affiliation, rather than civic membership. Since the early 1990s, the Georgian Orthodox Church has strengthened its role in the state building process. Moreover, in mutual historic memory, Islam is often associated with the enemy, and a threat to the Christian Georgian nation. Hence Kists, despite their Georgian family names and knowledge of the state language, are not perceived as an organic part of the Georgian nation. Salafism, an ultra-conservative Islamic doctrine, did not come to Pankisi overnight: it has been gradually growing in influence since the late 1990s and early 2000s, when it was brought by Chechen refugees. The religious gap between generations is now all too obvious. 'A year ago, about 70 per cent of the younger generation were Wahhabis [as local non-Salafis call them], and now almost 90 per cent of them are,' said a local NGO worker, who did not want her name to be published. She noted that the strict Salafi interpretation of Islam has reached all spheres of life. Even in public schools, children from Salafi families are forbidden by their parents to take part in any activities that involve dancing or singing. This is a matter of concern for the older generation, whose so-called 'mountain Islam', involves Christian and even pagan elements. More concerning are the actions of a small group of religious extremists, who have taken upon themselves the task of recruiting fighters for ISIS. Estimates of Pankisi-born IS fighters are between 50 and 200—a lot for a community this small. Why are the religious extremists succeeding? Although Pankisi is just a couple of hours' drive away from the capital Tbilisi, it remains a relatively isolated and socio-economically challenged region. According to the Kakheti Regional Development Foundation, a local humanitarian aid and development organisation, it is a poor region with only 10 percent official employment rate. 'There are other poor villages in Georgia, but people from there do not go and fight in Syria,' says Zaira, an ethnic Chechen from Pankisi, who insists that the persuasive ideology of religious extremists and local glorification of ISIS fighters are the main reasons for the extremists' success. Indeed, young people comprise 50 per cent of Pankisi's population, but there is little for them to do. With few other alternatives for recreation, the youth meet and socialise in Salafi mosques and religious schools. This leads to constant contact with Salafi religious leaders, and a general romanticisation of their brand of Islam. Radicalisation in Pankisi thus seems to be a self-fulfilling prophecy. A small group of radicals spread religious extremism, leading to sensationalist media reports on terrorism in the valley, causing further demonisation of the Kist minority and their alienation from the Georgian majority. This combination enables the further spread of extremism. On the national level, the government has introduced amendments to Georgia's Criminal Code, making participation and affiliation with foreign terrorist groups a crime. These amendments, passed on 12 June, allowed Georgian special forces' to make their well-documented arrest of Aiuf Borchashvili two days later. Borchashvili was later charged with recruiting local youth to ISIS forces in Syria. While some locals congratulated this move, others pointed out that it could have happened sooner. Nevertheless, there is some hope in Pankisi that this new law will discourage at least some people from travelling to Syria. In addition, Kists call for the state's assistance in training more Islamic teachers in opposition to Salafism. If you enjoyed this article or any others in the Ummah series, please consider following oDR on Facebook or Twitter.